Management Frame Protection (MFP) provides security for the otherwise unprotected and unencrypted 802.11 management messages between APs & Clients. MFP provides both infrastructure & client support. To use Client MFP, clients must support CCXv5 MFP and must negotiate WPA2 using either TKIP or AES-CCMP. To prevent attacks using broadcast frames, AP supporting CCXv5 will not emit any broadcast class 3 management frames. CCXv5 clients and APs must discard broadcast class 3 management frames. You can enable this feature globally on the controller (Security ->Wireless Protection Policies -> AP Authentication). AP Authentication & MFP is mutually exclusive features and only one can be configured on a controller. Here is the screen capture of this setting. 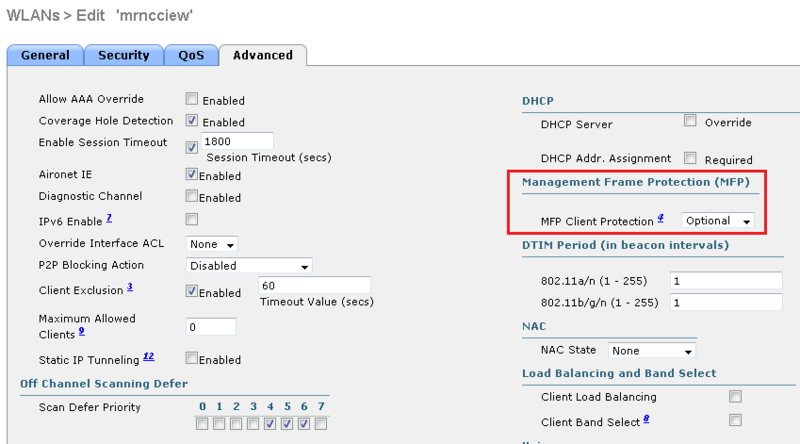 You can disable or re-enable infrastructure MFP per AP level as well. To do this you have to go to Advanced tab of a particular AP (Wireless -> Access Points -> All APs -<AP_Name> Advanced”) by tick or untick ” MFP Frame Validation”. Once you configure MFP you can verify settings by using ” Security -> Wireless Protection Policies -> Management Frame Protection -> General” section. If you are using CLI to configure this feature you can use following commands to do this. The above is based on WLC 7.0.116.0 configuration guide. IEEE 802.11w is the common standard for management frame protection. Windows 8 clients are support this standard & unable to connect to a network if Cisco MFP enabled unless you have compatible WLC code. Refer the below blog post from Cisco for more detail. I would like to inquire regarding infrastructure MFP validation on WLC code 7.6 as it is gone. Is it enabled by default already? Based on your output above, from WLC code 7.0, infra validation is still available on the AP. How can ap-impersonation/infrastructure be disabled per AP level? I tried looking for the option “MFP Frame Validation”. But could not find it.